Congratulations and thankyou to all those who took part in teh 2013 event where we had around 550 participants taking part in three different routes: a 50 mile; 80 mile and 100 mile ride. 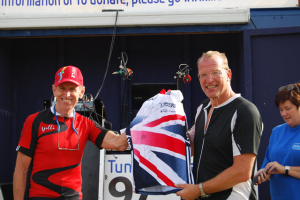 John Watson, aged 54, who coaches under 16s rugby for Marlow Rugby Club, was the lucky winner of an exclusive draw to win a Sky sponsored GB jersey signed by many of the Olympic track team including Sir Chris Hoy, Jess Varnish and Shanaze Reade. John Watson received his autographed jersey from former Olympic track cyclist Willi Moore, who designed the course for the Red Kite Ride. John admitted that he had to miss the first day of the new rugby season in order to take part in this year’s Red Kite Ride. He said: “They knew where I was but I really wanted to take part in the Red Kite Ride this year. I did the 50 mile event last September and the 100 miles today. It’s been a great day. I’ve really enjoyed it. Event Director Steve Tolmie labelled it a “huge success”, and added: “It’s been a great day and a huge achievement for the people of Marlow to put on this event. It’s great to feel a sense of community spirit and being so well supported by organisations such as the Marlow FM radio station. A new feature of this year’s ride was the opportunity to “ride the ford”. The ford in the Berkshire village of Twyford comes towards the end of all three distances and presented an unusual challenge to all entrants. The current depth is around eight inches and the length in the region of 40 feet. Course Director Willi Moore made some strategic changes to last year’s route including the diversion through the ford – the river Loddon. All three routes: 50, 80 and 100 miles – were directed through the ford. This proved quite a talking point among riders who enjoyed the challenge of “riding the ford” without getting wet. There were almost twice the number of entrants as last year and among those taking part was a former national road race champion, Bryce Beeston from Auckland, New Zealand. Bryce, now aged 65, was the 1977 New Zealand champion and also competed in the 1968 Olympic Games. He participated in the 50 mile Red Kite Ride. 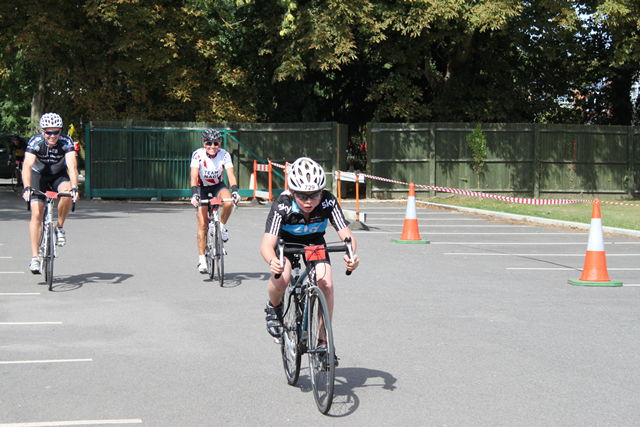 Ten year-old Theo Currie from West London was the youngest entrant and finisher completing the 50 mile event in a highly respectable 4hrs 36 mins. Young Theo was inspired to take up cycling by Bradley Wiggins’ efforts winning last year’s Tour de France. He rode with both his parents and it was only the second time he had cycled 50 miles . One rider who had a big surprise when he finished was Andrew Cooke from Charvill. 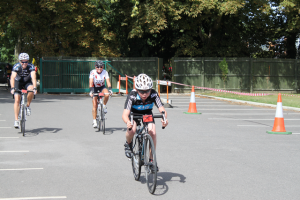 He completed the 100 mile ride to the tune of “Happy Birthday.” He was asked to go to the Marlow FM stand where he reported having had two punctures but his day was complete when he received a celebration birthday cake from the organisers. First prize in the raffle was won by Sam Calow from Tring, a member of the Leighton Buzzard Road Cycling Club. Sam was the winner of a top of the range GoPro Hero3 camera, which retails at £360. Saddle Safari from Marlow Saddle Safari Bikes – Parts Accessories Servicing Bucks who provided technical support at the start and bike spares for those who needed. And finally, the small army of volunteers, who provided such a great service to the riders, and without whom this event would not have been possible.